I have written earlier about the Third Quarter Challenge which is based on the Japanese Edo period. Once to show you the design I developed to use and the other to show you the felt I created. Then I showed you the disaster that included stitching and cutting out of the resist. I wasn’t happy with the results so I decided to start over. What could go wrong? I decided that I would make a silk screen with matte vinyl fuse. Then I could silk screen the design on to the previously dyed silk and then nuno felt the design. 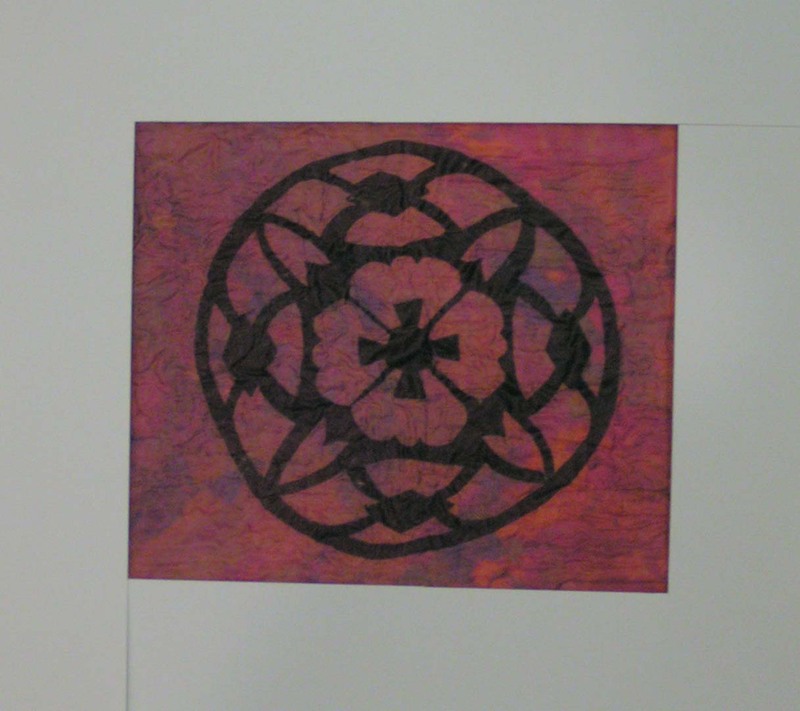 (If you’re interested in learning how to make this type of silk screen, it is included in my online class Experimental Silk Screening.) 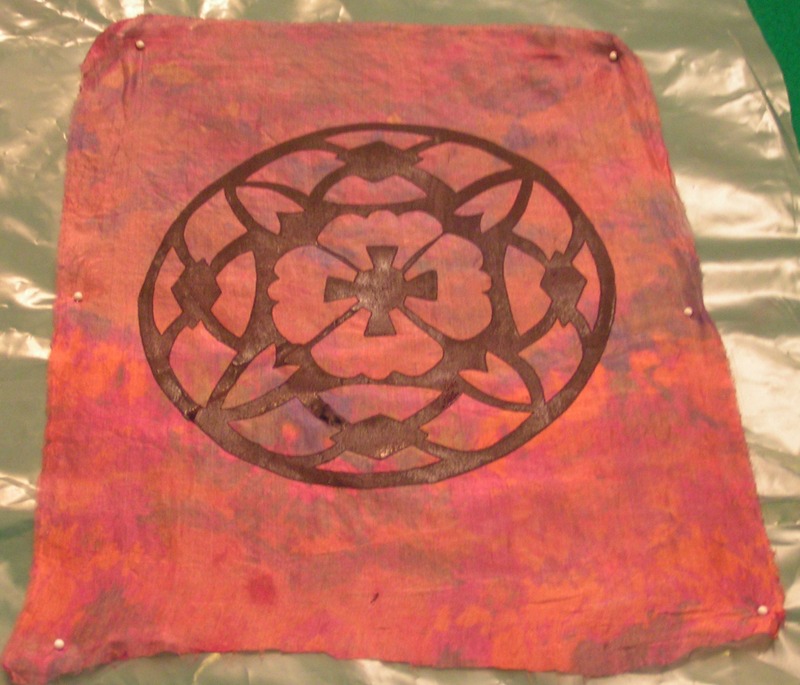 At our recent art retreat, I made up some really dark violet thickened dye and screened it over the silk. It looked perfect. I used Procion dye and soda ash to set it. Then, once home I washed it out in preparation for felting it. And every single bit of dye disappeared! Nothing was left at all. Arghh! I have since decided it was due to the fact that this is very thin silk and has been previously dyed and it just wasn’t going to take any more dye. Sigh. I have to tell you that I was discouraged. I had to go to my Art & Design class I really didn’t have time for this setback. But if nothing else, I have perseverance (AKA stubbornness). So one more try. I decided I would just screen print with acrylic paint mixed with screen printing medium. So that is what I did. The paint once dry wouldn’t disappear with application of water. So with a little bit of a different color, more maroon this time, I screened the silk. 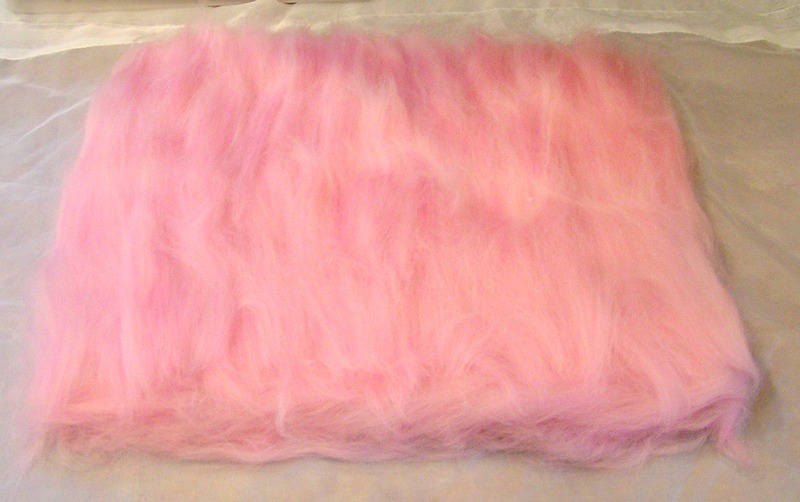 I laid out some pink Merino that Karen from Big Sky Fiberarts gave me a while ago. I made it fairly thick because I didn’t want a lot of shrinkage and especially with nuno felting, less wool equals more shrinkage and distortion of the silk. So here’s the wool layout with the silk on top. I proceeded with felting and the design finally did what I wanted it to do. It didn’t disappear and it pretty much kept it’s shape. 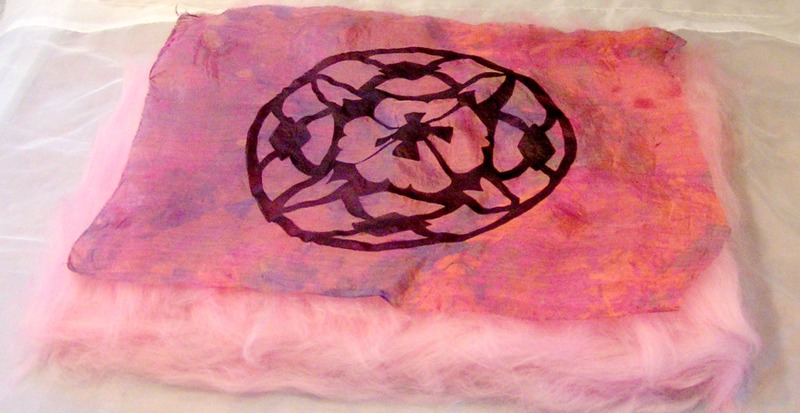 Here’s a poor photo of the piece after felting while still wet. I think if I never saw this design again, I wouldn’t mind. To say the least, this was quite a challenge. I am not sure what I am going to do with this piece of felt yet but for now, I’m just happy it’s finished. I also have found it interesting that many people think this is a Celtic design. I guess that many ancient designs have a similar feel but this one is based on the Japanese Edo period. And I finished before the end of the third quarter, I think it’s a miracle! This entry was posted in Challenges, Nuno Felting and tagged nuno felt, third quarter challenge. Bookmark the permalink. 11 Responses to I’ve Definitely Been Challenged! It looks good Ruth and your tenacity is to be admired. 🙂 I’ve looked at Japanese motifs and many are very similar to Celtic ones. Many designs are inspired by Nature or Geometric patterns, so as you say it’s not surprising to find similar motifs. Thanks Judith! Very true about many designs being inspired by the same sources. Felting tenacity is often rewarded and in this case it certainly was! I love the delicate background colours and the texture. The pattern kept in surprisingly good shape despite all the rubbing and rolling. Could it be used as an inset in a cushion cover? Thanks Lyn, I am sure it would work in a cushion cover or even a book cover. Will see what it turns into. It’s a shame it didn’t hold the original color, but I think it turned out great. And I’m glad you didn’t give up on it. Perhaps a black frame would hughlight more of the design color? Thanks Marilyn! I’m sure a black frame would work but I think it will end up being something functional. I already have too many wall pieces as it is. It turned out great after all your hard work. I think it would look great framed . Perhaps you need to start selling them in the shop. What is the finished size? Thanks Ann, I do try selling them in the shop. They don’t sell very well. The finished size is approximately 8 1/2″ x 11″. I like it as a square though.